Customer experience for the mobile is more important to our business at Latitude Technolabs than the average developers think. The evolution of customized app development has touched new heights. Developers at Latitude Technolabs are not only ready to work with smartphones and tablets, but also with various wearables and smart devices which contains Internet of Things. Native Apps and Hybrid Apps provides way to meet different needs and purposes of users and developers, and neither type of app can be said to be the perfect solution. Customer have to decide which one suits their needs better or which app is ideal for the business needs, including budget and specific goals. User Experience Native apps provide the best user experience as it is specifically designed for a mobile app can be the best fit. Whereas with the hybrid apps the UX will be lower as it is not possible to provide a good UX with just one app for all platforms. Development cost and time Native apps take longer time and costs more compared to Hybrid apps as it requires an app developer for each platform. 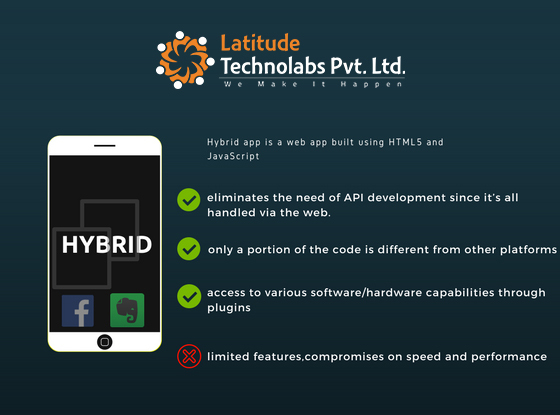 Hybrid apps takes the least amount of time and are developed at a fairly cheaper price compared to native app. Integration Camera, GPS and other features native to device can be seamlessly integrated into native apps. Some device features may be harder to integrate into hybrid apps. Portability Native apps are hard to port to other systems. Hybrid apps are easier to port to other systems. A native app is a program that has been coded in a specific programming language for the devices that have specific Operating System. For iOS, developer usually use swift and for Android it is Java. As native apps are for a specific platform, they can take advantage of operating system features. It has the advanced ability to use device-specific hardware, software, and it can use the latest technology available on mobile devices. 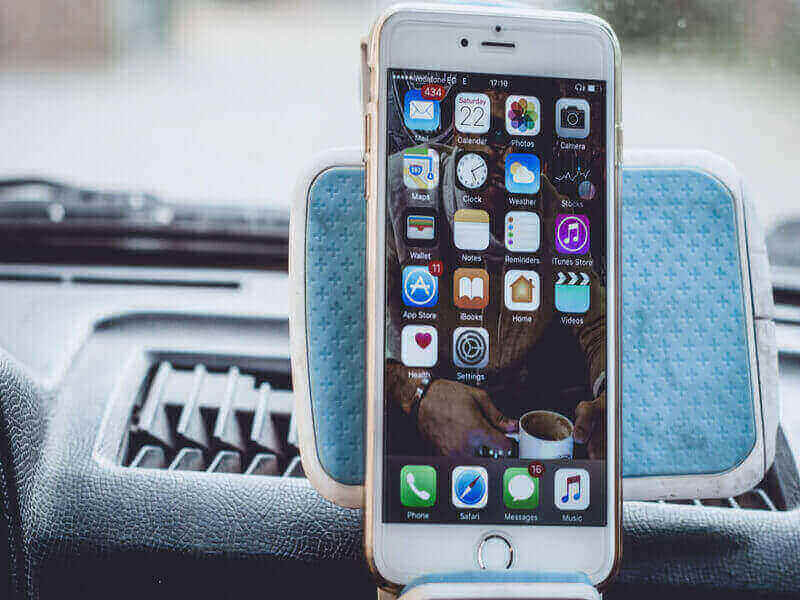 A large number of the most popular apps out there like Pokémon Go, Twitter, and Waze, are fully native. Building cross platform for native apps are Xamarin, React Native, Titanium. Excellent performance: If your customer looking for some high-speed application or game, then a native app is the right choice for the developer. As native apps are developed specifically for a certain operating system, they are much simpler, faster and more refined than their other counterparts. Better UI: The trendy look and feel of native apps is eye-catching and inspiring, which allows users to connect easily, and quickly to the icons and buttons. Better UX standards: Users choose either Android or iOS based on their individual characteristics. If user is using Android since a long time, they won’t face any problem in accessing their way around the app which follows platform specific UI standards. Safer and more secure: All the native apps of Android or iOS are accessible only through the app stores. Because native apps have to get the approval of app stores they are developed for, the business can be assured of complete safety and security of the app. Higher development and maintenance expenses: Native apps are quite complex because they have a different codebase for each platform. They require a lot of time and effort to maintain, since separate teams have to work on and support each version. No guarantee that apps will get accepted: Once the apps are created, they must be approved by the play store/app store, which can be a long and tedious process for the app creator/developer. Also, there is a possibility that the app might get rejected. Examples for Hybrid Mobile Apps are Amazon Appstore, Evernote, Twitter, Apple app store, Gmail, Khan Academy, Uber, Instagram. Hybrid App Platforms are PhoneGap/Cordova, Canvas. Less expensive: One of the unique qualities of a hybrid app is that it uses web technology for application content, and this fact makes building a hybrid app much easier. Unified development: The principal advantage of hybrid apps is that instead of building two apps, developers are building one app and tweaking it slightly so it works on both platforms. Fast development cycle: Hybrid apps can be developed easily in a short period of time. They require less maintenance as compared to native apps. Easy scaling: Hybrid apps are known as cross-platform apps, which are easy to scale on different platforms and on different operating devices. Slow performance: Hybrid apps are a bit slower because they are based on web technology. Hybrid apps use mobile platforms such as Kendo, Onsen, Ionic, and Cordova; these platforms cause apps to take more time to function, depending on the application, which can result in loss of performance. Poor UX: One of the serious concerns of a hybrid app is that it never offers a user the full native experience. The UX has to be flawless. Better UX allows more customer engagement and the future of the app. Design: Designing issue remains a factor as different Operating systems operate differently. The designer needs to fix the style as per different Operating System. Mobile development is transforming with modern business are approaching different apps. We know different apps have limitations in execution, but developers at Latitude Technolabs are increasingly coming up with solutions to overcome those challenges. At last, what matters is a great user experience, intuitive, responsive, security and speed. Developing an app that matches all the need of the client is the clear winner. No matter what your concerns are, we, at Latitude Technolabs, are here to help you out. We have a team of world class developers, who can give your business idea a mobile touch. Let us know your requirement, and our support team will get in touch with you within 24 hours. Our team of expert will analyze your need and suggest you the best development methodology. No regret in utilizing a free consultation.